This was the result of one of my late night forays into my playroom. I saw a Zetti House made by Yvonne at ARTic Blonde Creations which really had the WOW factor and this is my attempt. 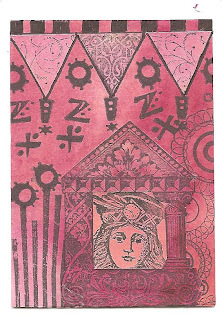 Since I've been blogging I've found I'm much more experimental with my stamps and I've been collaging using bits of them, rather than just stamping a whole, complete image. Its given new life to my stamp collection and revamped my enthusiasm for many that I'd grown a bit bored of and even some which came in kits that I didn't particularly like! Now, no stamp is a write off - they've all got something to offer. WOW, what a fabulous creation, Penny! So true about stamps and using parts of them! enthusiasm fills us up! wonderful piece! You've really been on a roll lately! This is one of my favorites. I've shied away from stamps so far wondering how often I would use one repeatedly but using parts would extend the usefulness for sure. I think I'll give it a try!!! thanks to you and yvonne! Your cards are always a delight to see! Stunning creation. What a fabulous card. Great work.